Now that I've retested NETGEAR's top-of-line draft 802.11ac R6300, we can proceed to the first of its new 11ac routers to be powered by Broadcom's second-generation router SoC. Like the R6300, the R6250 is a "Smart" router, running its "genie" admin GUI, with Android and iOS apps for remote access and admin control. 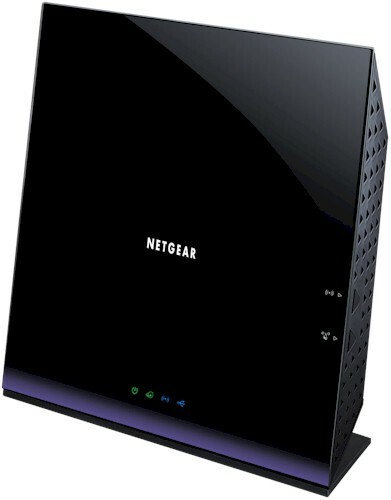 Unlike the R6300, the R6250 is an "AC1600" router. This means its 3x3 5 GHz radio supports link rates up to the current draft 802.11ac maximum of 1300 Mbps. To shave a little cost and provide a lower price point, the 2.4 GHz 802.11b/g/n radio is only 2x2, supporting a maximum link rate of 300 Mbps. Perhaps to not upstage its more expensive sibling, the R6250 is somewhat smaller at 7.5" wide and just shy of 8" tall. It still assumes the upright stance of the R6300 and has similar design features, however. Backlit icons adorn the front, while all ports are on the rear. Like the R6300, the 6250 has only power, Internet, Wireless and USB status indicators on the front panel and no link or activity indicators for wired network traffic on either the front panel or Gigabit Ethernet rear panel WAN or LAN ports. Because the new Broadcom BCM4708 processor includes it, you get only one USB 3.0 port vs. the 6300's two USB 2.0 ports. The R6250 is intended to sit on a table on its non-removable base. NETGEAR put all the Ethernet jacks on the bottom edge so that there is no danger of the router being pulled over by cable weight. The only gotcha I found with Ethernet port placement is that if you are using hooded cables, you may struggle to disconnect them. NETGEAR's FCC confidentiality request doesn't expire until September 18. So after testing was complete, I opened up the R6250 for a look-see. The view below is with the front cover removed. Not much to see here. Because the antenna connections would be impossible to make once the board was installed into the case, the designers prewired the antennas and put them on a removable frame, as shown in the board shot below. The three 5 GHz antennas and two 2.4 GHz antennas are all NETGEAR "Patent pending" circuit boards. I had no luck prying off the RF shields and the large black heatsink for the main SoC processor is solidly pinned on. But I'm pretty sure there is a Broadcom BCM4708 series SoC under it. Note the black tape covering the area between the processor and USB 3.0 connector. I'm assuming it has some shielding qualities and is NETGEAR's approach to solving the USB 3.0 / 2.4 GHz interference problem described in this Intel whitepaper. The smaller ceramic heat spreaders were only stuck on with thermal tape. The one at the photo upper left covered the Broadcom BCM4360 5G WiFi 3-Stream 802.11ac Gigabit Transceiver that has been the mainstay in all draft 11ac routers to date. I'm guessing that this is accompanied by three external 5 GHz power amplifiers under the small RF can. I'm also guessing that the 2x2 2.4 GHz radio is the same BCM43217 used in the Linksys EA6300v1 / EA6400. The larger spreader to the right of the big heatsink covered 256MB of Samsung RAM (K4B2G1646E). The 130 MB of flash comes from two devices, which I thought was an interesting arrangement. I've summarized this all in Table 1.